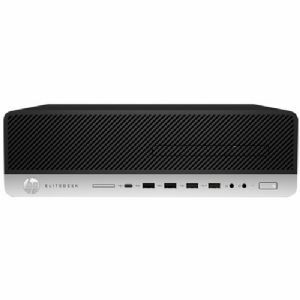 Make each work day productive with the HP EliteDesk 800 G4 SFF Desktop PC. It is one of the most secure and manageable PCs featuring high performance and expandability in space-saving, stylishly designed chassis for the modern workplace. This desktop is built to fulfill all business related tasks. Enjoy a seamless system performance with the power provided by the Intel Core i7-8700 Six-Core which maximizes your desktop's ability to manage complex tasks at a great speed of 3.2GHz. Together with an 8GB of DDR4 memory, it makes multitasking possible by reducing lags and other incompatibilities during usage. In addition to this is a storage amounting to 256GB of SSD which yields a fast boot-up and app launch time, as well as enough space for data and files. Take productivity up a notch with the ability to do more with its integrated Intel UHD Graphics 630 professional graphics. It is installed with Windows 10 Professional 64-bit operating system that provides a user-friendly interface and innovative features for optimum system performance. Do not think twice and purchase the HP EliteDesk 800 G4 SFF Desktop PC now!